Dear Friends, I hope you are preparing for IBPS CWE Specialist Officers- IV Exam 2015 which is going to be held on 14/Feb/2015 and on 15/Feb/2015. IBPS conducting this exam for the following posts which is given below . 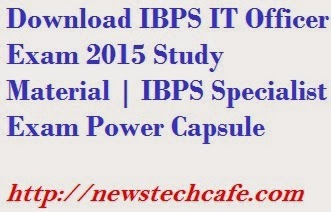 Today we are sharing a Power Capsule for the Networking which is highest scoring subject to get success in IBPS IT Officer Exam 2015 .Download this Power Capsule for the Networking to secure 20-25 Marks in IT officer exam. Soon i will upload more study material regarding IBPS CWE Specialist Officers- IV Exam 2015. Stay Updated with us.